The pointed granite peak of Beinn Dearg stands out proudly above the surrounding rounded hills. The 'red hill' - as its name translates - displays individuality. The 1008m high Munro is surrounded on all sides by broken ground and scree slopes, distinct from the surrounding peaty plateaux. For a novice hillwalker keen to bag a Munro, and at the same time experience the joys of staying overnight in a bothy, the walk from Blair Atholl to Beinn Dearg is ideal. Day 1 Start out from the public car park located just west of Old Bridge of Tilt. At its entrance, turn left and follow the minor road west to Old Blair. Wander down through the hamlet and stay with the road as it curves right. It leads down to a bridge (at grid ref 866665). A few yards on, take the first right and follow the track up a steep incline through woodland. Beyond a house on the left, the track flattens out a bit but continues to climb. A little over a mile on there's a junction in the path. Take the right hand option and head over a bridge (at grid ref 858674), then turn left and continue up through the coniferous woodland. The track leaves the forest at a gate and strikes out over open heather moorland. Although there are no really steep sections, the walking is quite hard work as the route gains height over a fairly long distance. A mile or so from the woodland there is a monumental cairn to the right of the path. A short way on the track crosses a burn by an old stone bridge and continues in a northerly direction. It continues to rise and two miles from the stone bridge a fairly substantial span made from old railway sleepers guides you over another stream. The open bothy at Allt Sheicheachan is reached a mile further on, just beyond the track's highest point. A curving descent leads to the former stable building with its black corrugated iron roof and postbox-red doors. This tiny refuge is maintained by the Mountain Bothies Association and it takes its name from the burn running adjacent to the building. Inside you'll find two rooms on the ground floor and a sleeping area in the attic. You've covered just under six miles so far. Provided you set off reasonably early, there should still be time to conquer Beinn Dearg. From the bothy a track leads up the Allt Sheicheachan burn. At grid ref 850751, near the head of the glen, a path leaves the track and heads up the mountain. The route is steep and gains height quickly. The path continues into a pass to the south of the summit. There is still a fair climb from here over open moorland. The incline along the eastern flank of the peak is fairly gradual and on a clear day the top is visible ahead. At an elevation of around 900 metres the ground becomes increasingly stony and stays that way until the trig point on the summit is reached. When you're ready to move off again, follow the route of ascent back down to the bothy. 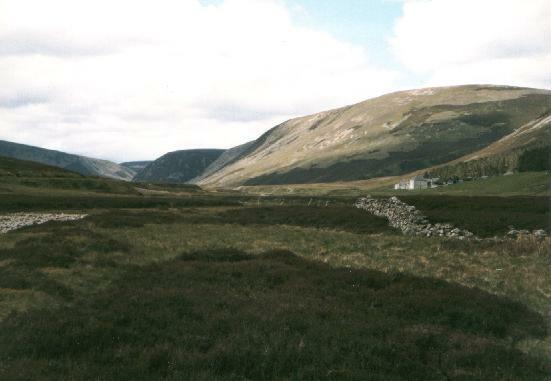 Allt Sheicheachan was formerly used as a shelter for stalkers hunting on the vast Blair Atholl estate. The main room, on the left as you approach, has an open fireplace and at one time the interior walls were a paneled with wood, making it a fairly cosy stop-over. The door on the right leads to a stable where ponies were kept. It now provides access to the upper floor sleeping area. Day 2 From the bothy, cross the burn and head north on a small path through the heather to Bruar Lodge. 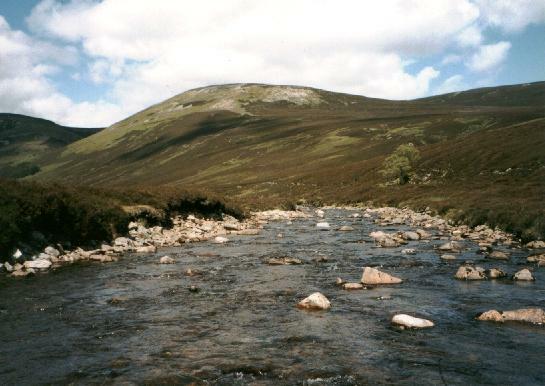 Cross the Bruar Water at a bridge in front of the lodge and take the track south down Glen Bruar. The way follows the river downstream, passing a small dam (at grid ref 823725). A mile or so on there is a well kept cottage (although usually the windows are boarded up) at Cuilltemhuc. Leave the track here and follow the path down to ford the river. Depending on the height of the water you may need to roll up your trouser legs and wade. On the other side, follow the way up to the ruined cottage at Ruichlachie. This is occasionally used as a makeshift bothy but the condition of the building would make for a pretty bleak and miserable night and it's not recommended. 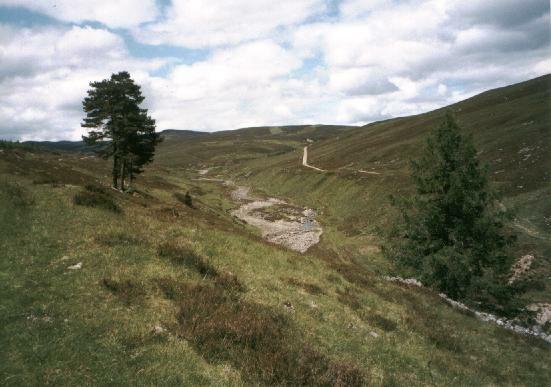 The path rises gently over open moorland to Glen Banvie Wood. A track is joined just within the tall pines. Turn left and follow this east. It soon leaves the forest, offering grand views over Glen Banvie. It's not uncommon to see large heads of deer on the hillside to the north and also visible on the slopes above are the remains of long abandoned settlements. The track reaches the forest in which the walk began. Cross the stile and, once in the plantation, follow the track down to the bridge below Old Blair, then retrace your steps from here to the car park. Start/parking Public car park 200m west of Old Bridge of Tilt GR: NN 874663. Grading A long walk through open country with track and path throughout and the option to split it into two days by staying overnight at Allt Sheicheachan, an open bothy. In the spring, summer and autumn Beinn Dearg is a straight forward ascent. With snow on the ground, however, pack ice axe and crampons.